What's more fun than a good old-fashioned Easter egg hunt? 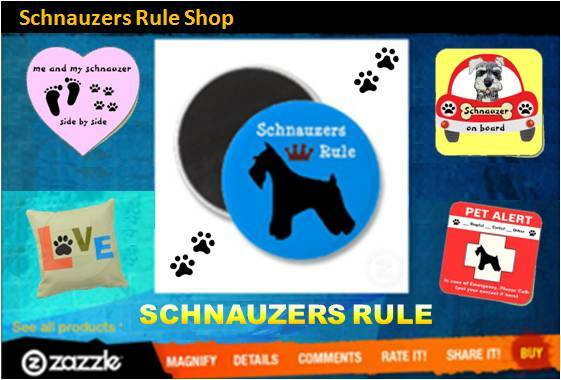 Well for your Miniature Schnauzer it would probably be an Easter dog treat hunt. And that's what we have for you here. You see, Miniature Schnauzers were originally bred to hunt vermin and today they still have strong hunting instincts. That's why they love to chase and explore. The other thing Miniature Schnauzers love is being with people, their owners in particular. They also love a challenge and lots of praise for a job well-done. And if the praise also involves yummy treat rewards, all the better. 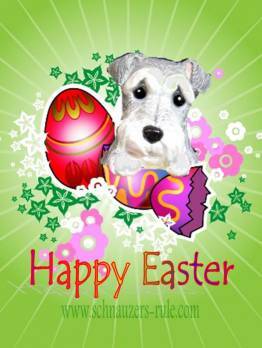 That's why this fun Find the Treat dog game makes the perfect activity for Miniature Schnauzer owners this Easter. Bake up a batch of our yummy Tuna Balls (see recipe below). Hide treats around your home. Release your dog to seek them out. This is our very own Easter Tuna Balls Dog Treats recipe. It is super simple to make and a great treat recipe for diabetic dogs, too. Of course it doesn't have to be Easter to make these tuna balls for your Mini Schnauzer who is sure to enjoy the thrill of the hunt any time of the year. So if your ready let's head to the kitchen. Whisk egg in a medium sized bowl. 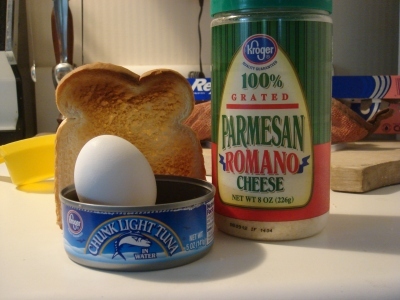 Drain water from can of tuna fish. Cut toast into very small pieces and fold into mixture. Add 2 tablespoons of water and mix. Scoop out small amounts of meat mixture and roll into little balls in the palm of your hand. 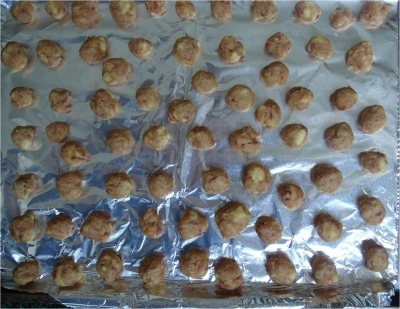 Place rolled balls on a cookie sheet lightly sprayed with nonfat cooking spray. Make the treats about the size of a gum ball (see photos). Let the treats cool completely. Store left over treats in a food storage plastic bag (like Ziploc). Keep in the refrigerator for 3 days or place in freezer for months. Tip: If you are going to store treats in the freezer, put them on a flat surface, like a paper plate and allow them to freeze for 2 hours. Then put the frozen Easter dog treats tuna balls into Ziploc bag. This will keep the tuna balls from sticking together. Also if you are going to have a hunt outside in the yard, make the tuna balls about the size of meatballs. Now that we have all our tuna balls made, it's time to play the Easter Hunt Dog Treat Game. Aroo! Put your Miniature Schnauzer in a SIT - STAY somewhere he cannot observe what you are doing. A good place is to have your Schnauzer stay in a bathroom or laundry room. Next, take 10 treats and hide them around a couple of rooms in your home. I mention 10 treats because it will be easier for you to remember exactly where you placed them all, just in case your dog has a bit of trouble finding them. After all the dog treats have been hidden, go release your Miniature Schnauzer and encourage him to find the treats. Once your dog finds the first treat be sure to praise him verbally and then tell him to go FIND IT so he continues looking for the other hidden treats. It won't take your Schnauzer long to figure out there are treats hidden. The smell of the tuna fish is strong enough for him to find all ten treats, I'm sure. Trust me when I say this will end up being one of the best games you play with your Miniature Schnauzer. He will love the challenge of the hunt and it will be mentally stimulating for him as well. Each time you play, you can make the hiding places a little more difficult. Just make sure you always place the treats where he will be able to get to them on his own, safely. 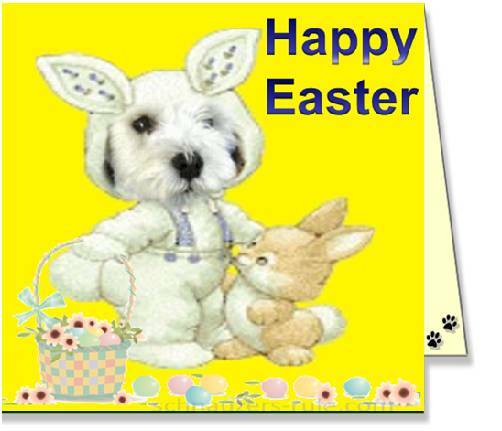 Be sure to wish your family and friends a Happy Easter this year by sending them a free Easter dog ecard. And if they own dogs of their own, share our Tuna Balls Dog Treat recipe and Easter Hunt game with them to try out on their own dogs. Aroo! Share Your Easter Ideas for Dogs.